This form is designed to show you available options based on your choices, so take some time to experiment with various elements. You can save $500 by selecting one of our Non-Standard sizes. This number refers to how many different designs are needed on the backs of your cards. If every card has the same design on the back, select 1. If you have multiple designs, select the appropriate number. Available packaging options change based on card count and paper weight entered above. Pages are two sided and are in multiples of 2. Input the size of your unfolded sheet. The orientation can be either portrait or landscape, and we will fold your instructions to fit in the box. Our instruction sheets are made with 85lb text gloss paper. Our standard instruction booklets are made with 85lb text gloss paper and bound with the saddle-stitched method. 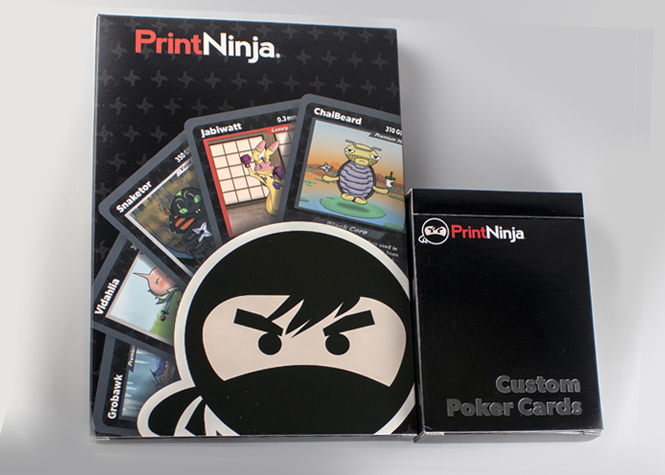 Due to the setup costs involved in offset printing, PrintNinja is not able to produce smaller orders. Print-on-demand companies like our partner Chicago Pressmen are a great fit for these projects. If you have concerns about how your colors will look when printed, we recommend adding a hardcopy proof to your order. Hardcopy proofs add three (3) weeks to your turnaround time. If your project has unique requirements or if you are interested in the cost of additional specialty add-ons, please lock in your quote and add your request in the additional information box. If you are still not finding what you like, please contact us for a custom game price quote. First time printing cards? Does the idea of a “blue core” card seem totally foreign to you? Do you want to be sure that you have thought through all of your options and felt all the papers and finishes that we offer? We heard you! The two components of our card sample packs will allow you to touch and feel the work that we do while you’re getting ready to print.